Are you looking for outstanding quality umbrellas? Look no further than ShadeMaker! Strong, durable, eye catching, and really LARGE! The Astral-TC is a the perfect shade solution for any resort, hotel, restaurant or even your own home. Great quality at a fraction of the price of a Tuuci umbrella. Manufactured from the finest aluminum alloys to ensure the strength, durability. and integrity of each and every umbrella. 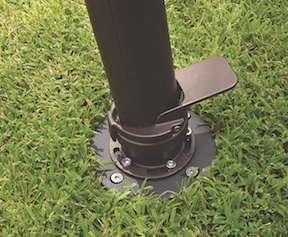 Constructed with one piece aluminum pole, durable high performance hub and fittings. The Astral-TC has a telescoping mast that allows the umbrella to be closed so it does not hit the tables beneath it. The easy crank lift mechanism makes it easy to open and close your umbrella. 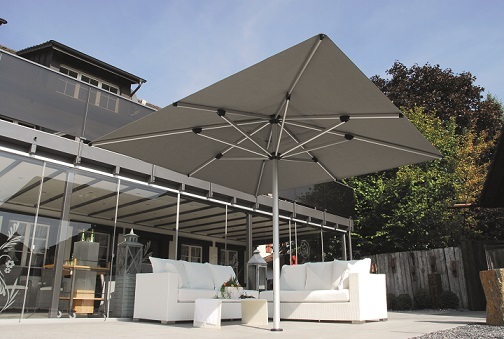 Sunbrella, Outdura, and O’bravia awning fabrics make this one of the best quality umbrellas in the industry. These commercial grade fabrics are easy care, stain and mildew resistant with wonderful rich color that will last through the years with proper care. Covers can also be made in Firesist flame retardant fabrics. Firesist satisfies most fire codes and commercial applications such as restaurants, shopping centers, and hotel lobbies. 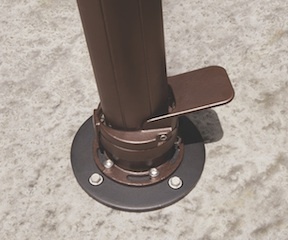 Telescoping Mast allows umbrella to be closed, so it does not hit the table beneath it.